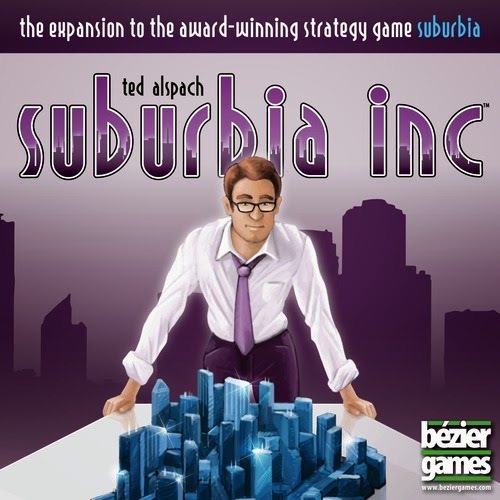 Suburbia Inc does not mess with the gameplay elements of vanilla Suburbia at all. It simply adds in more tiles, unique tiles ( now known as borders ), more goals, and a new way to power up your income and reputation mid game. Apart from that the game plays exactly as it did in the base game. Buy a tile, expand your city and balance your income and reputation engines so that by game end you have the biggest and baddest reputation in the entire neighborhood. So, by not changing much in terms of how the game plays, does that mean that the expansion isn't worth its weight in gold ? Well, i am just going to spoil everything early and say that this is the BEST expansion of the year ( and possibly the best expansion i have ever bought to date ). There, i said it. And in case you think this is no mean feat, there have been some really good expansions this year ( Legendary Dark City, Scoundrels and Skullport ). I have them both and i will say that Suburbia Inc adds so much more to the gameplay and replayability of Suburbia that the other 2 expansions will have to wrestle it out for 2nd place. Alright ! So what makes it so great ? Well, the first noticeable addition from Suburbia Inc are the mid-game bonuses and challenges. Each game only uses one bonus and one challenge and they are triggered upon depletion of the A stack and B stack respectively. When the A stack is depleted, the bonus takes effect, and when the B stack is depleted the challenge takes effect. Think of them like the goals except that all the players may achieve it. The bonus rewards the players with an income boost, and the challenge rewards a reputation boost instead. The bonuses and challenges requirements are stuff such as, have at least 5 yellow tiles, or have a certain minimum score at that point, or have at least 2 borders. All very doable and easy to explain, but when combined with the open & personal goals, it creates a certain dilemma from within and also opens up the avenues from which points may be contested and scored for. The best addition however are the border tiles. These are bought and placed just like the regular tiles but they are longish and add boundaries to how your city may be built. Some of the border effects are crazy good, but so are it's prices and placement restrictions. I just love the look and feel of the borders and how they add personality to your city. Each player's city will now look vastly different in terms of shape and orientation, and not just by color anymore. For real people. The other additions of more goals and more tiles are basically more of the same. But the additions are interesting in their own right as some of the new building tiles have wicked abilities. One special building ( redevelopment planner ) allows you to buy it as a placeholder and on a later turn, use it in exchange for any building on the purchase track. Another building ( redistricting office ) allows you to steal points from every other player ! Nasty but also pretty expensive. It certainly feels like a lot of thought went into the creation of Suburbia Inc. It makes the game more fun, increases its replayability, adds another level of direct and indirect interaction, but yet at the same time, not increasing the learning curve nor its approachability. It also does not fall into the trap - which most expansions do - of making the game more fiddly, unnecessarily complex, nor does it extend the playing time of the game. And that people, is the hallmark of a great expansion. When i first punched out my copy of Suburbia Inc, i made sure to keep the expansion separate from the base game in case i wanted to start things slow for newcomers. 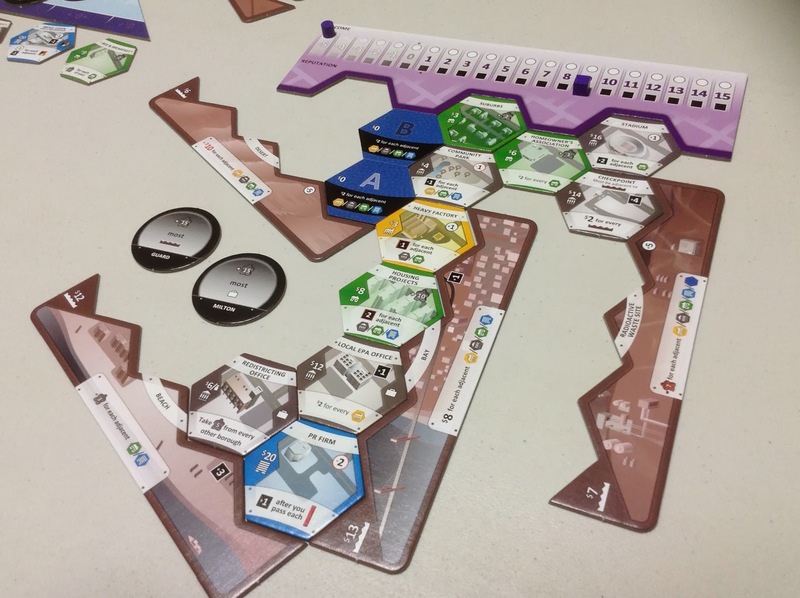 But after playing the expansion on Eric's copy, we both agreed that it is a no-brainer. Never again would we play Suburbia without its expansion. Suburbia + Suburbia Inc = Suburbia Plus. And Suburbia Plus is a gem of a game.